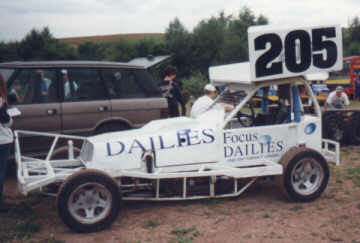 Stuart Jones has been doing BRiSCA F1 for about a year now, and as such, is classed as a white top ( newer driver ). 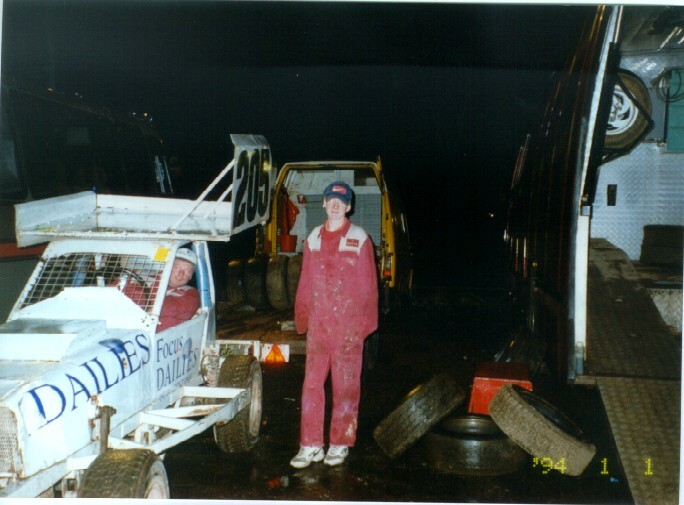 This page will bring you photos of his latest race( and possibly his last in BRiSCA for the time being) held at the Birmingham Wheels Raceway on the 24/10/98. On with the Photo Shoot!!!!! 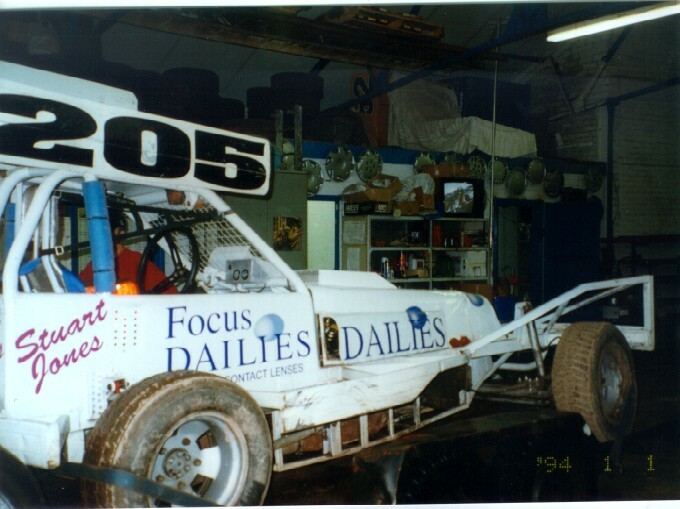 But first a little bit about Car 205, sponsored by Focus Dailies (Contact Lenses). Car 205 has a small block 350 Chevrolet V8. Car 205 has an power output of about 600BHP. Car 205's engine has an engine note that, at tickover, can be heard over 300 feet away. Ooooh, yes! On rev, Car 205 can be heard at least twice the above distance, and felt too ( Ground vibrates for that all over body experience). 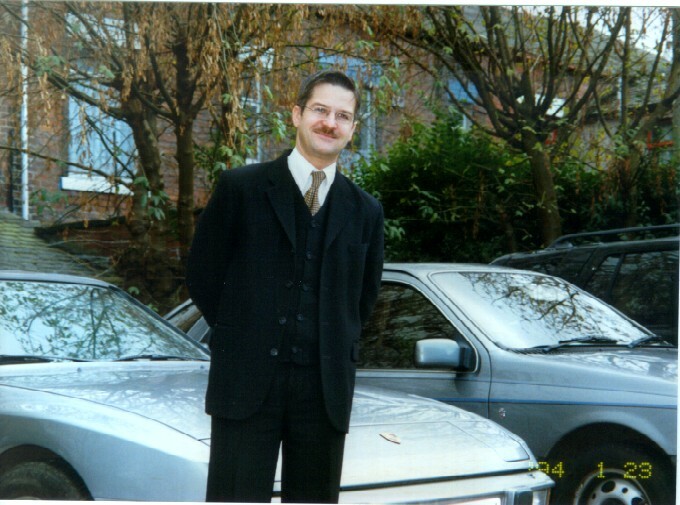 Not at Wheels at all really.Stoke I think, with The Car. Just a great picture showing 205 in all its glory. Thanks to Dave Carter for this photo. In the garage at Rochdale, before setting off for Wheels. The hood's still up till the last minute. (Note : Heavy rain outside, roads out of Rochdale are being closed. More Speed.Must go faster!). Finally get the beast on the trailer! We are ready for the off. 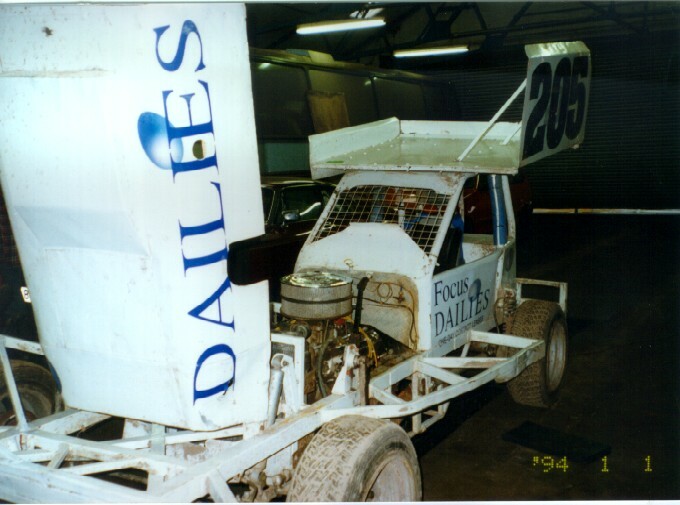 Car 205 in the 'pits' prior to racing. It is being 'carefully' warmed up after its 3 hour trip by stand in Mechanic & good friend, Tom Kershaw and, watching, his son, also Tom. My job was taking care of safety gear ie clean & care of helmet, harness etc. 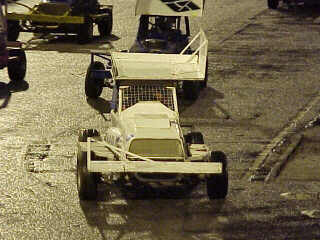 This is at Wheels Raceway and Stu's just entering the first corner IN FIRST PLACE!!!. Thanks to Dave Carter. Car 205 still making everyone play a rather one sided game of 'Follow My Leader'. Thanks to Dave Carter. Slight change in plan. The tracks drying out now, and the power advantage of the gas guzzling godzillas has meant our beloved Stu has slipped into about fourth place. 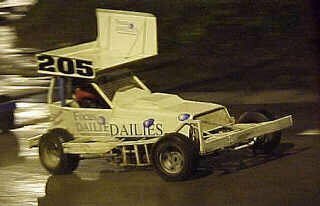 But not for long as our Stu, showing his class and former Formula Ford history casually (notice the hand nonchalantly out the side) takes, on the inside, Dan Clarke, a driver more experienced at BRiSCA than our Stu, as he's a Red top. Thanks to Dave Carter. Well, it was a good night. Ended fourth in the first race, after several laps in the lead!!! The rest of the evening was no less exciting. Made some prize money, so no complaints. .....And please put your hands together for the man himself, Stuart Jones!!!! Big round of applause!! ATTENTION ALL STOCK CAR DRIVERS!! 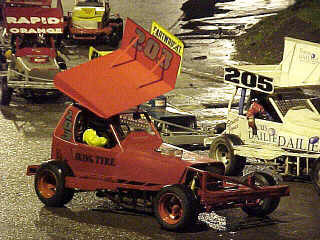 Car 205 is now up for SALE. CLICK HERE FOR THE DEAL!!! !